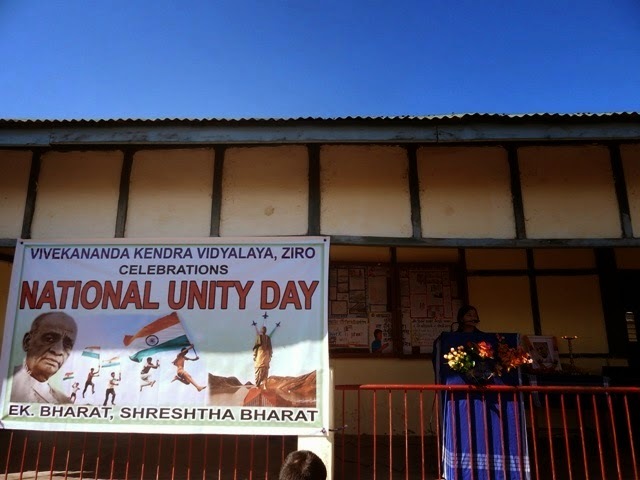 Vivekananda Kendra Vidyalaya, Ziro, Arunachal Pradesh celebrates National Unity Day, the Birth Anniversary of the “Iron Man of India” Sardar Vallabhai Patel with full sprit and Enthusiasm. The programme started with the lighting of the lamp By the Chief Guest, Sri. Kuru Tai,an social Activist and Sri. Anand Mohan Mishra, Principal,VKV Ziro. Ku. Gora Chiku,student of Tenth Standard Highlighted the Life history of Sardar Vallabhai Patel which was followed by an Patriotic song .Sri. Kuru Tai in his speech urged the student to develop the feeling of patriotism, unity, integrity and security. He brought to light the work of Sardar Vallabhai Patel in making One India and allured the students to follow the path showed by him. Sri. Rudra Prasad Upadhaya,Teacher,VKV Ziro endured the programme with the pledge taking ceremony for the students. Sri. Anand Mohan Mishra Inaugurated the Poster making Competition for cLass IX-X students on the Theme”Unity,Integrity,safety and Security” and even flagged off the Marathon “ Run for Unity”. The programme stub with the National Anthem.